Aram-Damascus (/ˈɛrəm/ or /ˈærəm dəˈmæskəs/) was an Aramaean state around Damascus in Syria, from the late 12th century BCE to 732 BCE. The largest portion of the textual sources come from Assyria. There are, however, often several copies of the same texts. Most of the texts are annals from the Assyrian kings Shalmaneser III, Adad-Nirari III, and Tiglath-Pileser III. The texts mention Aram-Damascus (Ša-imērišu, Imērišu, Imirishu) from an Assyrian perspective, but are in many ways informative of the strength of the state, and give us several names of its rulers. Aramaean royal inscriptions are rare, and only one royal stele from Aram-Damascus proper has been identified — the Tel Dan Stele. Other sources in Aramaic that shed light on the history of Aram-Damascus include two "booty inscriptions" from Eretria and Samos, and the Zakkur stele of the king Zakkur. The Hebrew Bible gives more detailed accounts of Aram-Damascus' history, mainly in its interaction with Israel. For instance, there are texts of the Bible mentioning David's battles against Aramaeans in southern Syria in the 10th century BCE. (2 Samuel 10:6-19) In contrast, the sources for the early history of Aram-Damascus are almost nonexistent. In an annal dating to Tiglath-Pileser I (1114-1076 BCE), we learn that Aramaean people have begun settling in the southern half of Syria. 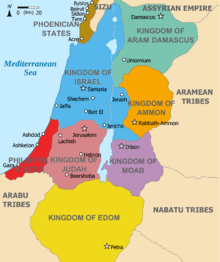 To the southwest, Aram-Damascus reached over most of Golan to the Sea of Galilee. In the 8th century BCE, Rezin had been a tributary of Tiglath-Pileser III, the king of Assyria. In c. 732 BCE, he allied himself with Pekah, the king of Israel, to attack Ahaz, the king of Judah. However, Ahaz appealed to Tiglath-Pileser III for help. This the Assyrian king obliged, after Judah paid tribute to the Assyrian king. (2 Kings 16:7-9) As a result, Tiglath-Pileser III sacked Damascus and annexed Aram. According to 2 Kings 16:9, the population was deported and Rezin executed. Tiglath-Pileser also records this act in one of his inscriptions. Archaeological evidence of Aram-Damascus is close to nothing. Excavations in Damascus are hard to perform, owing to the continuous settlement of the city. Other cities of Aram-Damascus have not been positively identified from textual sources, and excavations of Iron Age sites around Damascus are almost nonexistent. The material culture at sites farther south (e.g. Tell-Ashtara, Tell er-Rumeith, et-Tell, Tel-Dan, Tell el-Oreme, to name but a few) do not show many features distinguishing from the material culture of ancient northern Israel. ↑ Arameans, Wayne T. Pitard, Eerdmans Dictionary of the Bible, ed. David Noel Freedman, Allen C. Myers, Astrid B. Beck, (Wm. B. Eerdmans Publishing Co., 2000), 86. ↑ James B. Pritchard, ed., Ancient Near Eastern Texts Relating to the Old Testament (3rd ed. ; Princeton NJ: Princeton University Press, 1955) 246. ↑ Suzanne Richard (2003). Near Eastern Archaeology: A Reader (Hardcover ed.). Eisenbrauns. p. 377. ISBN 1-57506-083-3. ↑ James B. Pritchard, ed., Ancient Near Eastern Texts Relating to the Old Testament (3rd ed. ; Princeton NJ: Princeton University Press, 1969) 283.